THANK YOU MAHC BOARD MEMBERS! Over the past two years, I have had the honor of serving as President of the Maryland Affordable Housing Coalition. I have followed in the footsteps of people for whom I have great admiration, and have striven to build on their good work. MAHC has had many accomplishments over the past two years - we forged a stronger relationship with the new leadership at the Maryland Department of Housing and Community Development, celebrated our 15th anniversary, participated in the revisions of a new QAP, worked with the MD DHCD on a streamlined draw policy and closing costs guidelines, significantly increased our membership and sponsorships, and held more educational opportunities through our brown bag series. All of this work was accomplished through the very active MAHC committees and the able oversight of our executive director, Miranda Darden. Many thanks to the committee chairs, members and to Miranda for their service. MAHC has a strong voice in the affordable housing industry, and we continue to grow stronger, speaking with a unified voice on the need for better programs for affordable housing. There will be many opportunities ahead to bring our knowledge and expertise to our work in Maryland. As practitioners in the development of affordable housing, we can turn our collective experiences into good, sound policy. I urge everyone to get involved and help make a difference in improving the delivery of quality affordable housing in Maryland. Congratulations to Ivy Carter on becoming the next President of MAHC. I look forward to my continued involvement with MAHC and wish the leadership team much success in guiding the organization over the next few years. 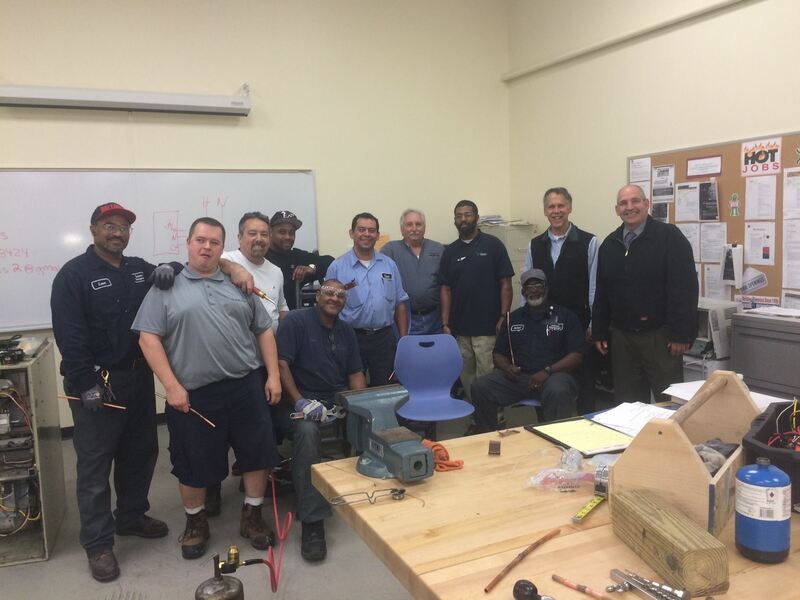 The MAHC Property Management Committee has developed a great relationship with CCBC and has offered a customized hands-on training for Maintenance Tech staff for the last three years. This year, staff from The ARC, CT Group, Habitat America, The Shelter Group, and Towner Management participated in the 5-week course designed especially for MAHC members. Congrats to the graduates of this year's program! The brown bag lunch series continues on July 28, 2016. We will meet in Columbia to talk about developing siting and barriers to developing in Communities of Opportunity. We'll also hear about a local advocacy group's new marketing campaign to change perceptions about affordable housing. On August 4, 2016 we're holding a special session at DHCD Headquarters in Lanham to review the changes to the LIHTC Application for the Fall 2016 Round. Go to our CALENDAR PAGE to register for any of our upcoming events. DHCD issued the second draft of the QAP and Guide for 2016. Comments were due by June 27, 2016, and they plan to release the final draft by mid-July and hold a final Public Hearing at their Headquarters in Lanham on July 28, 2016 at 6:00 pm. To view the draft QAP, Guide, and all other documents released by DHCD go HERE. DHCD has issued the draft allocation plan for the National Housing Trust Fund and will hold a series of public hearings the week of July 12, 2016 to accept final comments on the proposed use of funds in Maryland. Go HERE to read the full notice and view the hearing dates. The Maryland Affordable Housing Trust will hold its Round 40 grant competition this summer. Applications will be available on their website beginning on July 15, 2016 and will be due on August 31, 2016. Go HERE for more information. DHCD recently published two funding announcements. The first is for $3.7 Million, available for the installation of energy conservation measures in multifamily buildings in BGE territories where at least 80% of tenants earn 60% AMI or below. Priority will be given to master metered buildings and work must be completed by April 30, 2017. Go HERE to review the announcement. Also, $250,000 is available for builder operator training, which also must be for properties in BGE service areas and completed by April 30, 2017. Go HERE to review the announcement. Congratulations to Southway Builders on their 25th Anniversary and to Willy Moore who was recently named President! The Community Development Network of Md (CDN) is conducting a Return on Investment Study to determine the housing and community development industry's economic impact across Maryland. The survey is open through June 30, 2016 so please take a few moments to have your work counted! The survey can be found HERE. CohnReznick is holding their Fall Affordable Housing Conference in Philadelphia on September 20-21, 2016. Go HERE for more information or to register.